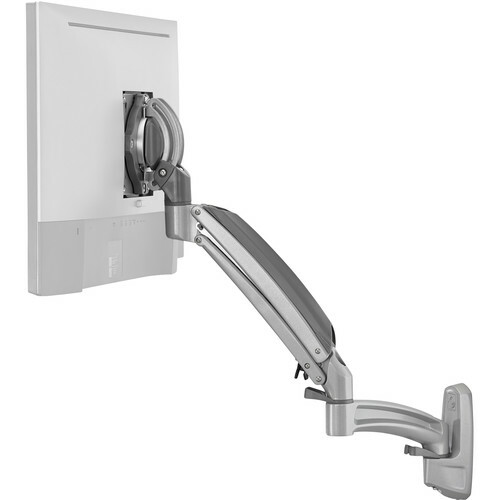 Extends from 2.45 to 20.31"
Mount your 10 to 30" display to a wall with the silver Chief K1W120SXRH Kontour Dynamic Height-Adjustable Wall Mount. It supports displays weighing between 5 and 25 lb with 75 x 75 and 100 x 100mm mounting patterns and provides -10 to 75° of tilt adjustment plus 13" of dynamic height adjustment via gas-spring technology. The mount extends 2.45 to 20.31" from the wall to provide a range of positioning options and you can mount your display in either landscape or portrait orientation. An integrated cable management system keeps your wiring looking neat.